Whoa! didn't realize how long it's been since I've actually updated this page! We're almost at the end of football season and I've only updated this page twice now, oh well, you'll have to forgive me, I've been a wee bit busy...neways...Ok people! We had a copuple drop outs I should have informed you about earlier, The line up is: Keira, Candace, Chasity, Whitney, Sarah, Me, Ashley, Ty, Stacie, Kathy, Alyssia, Holly, Laura, Britney, and our lil Tamara is a substitute. Holly, Laura, and Tamara dropped, we've gotten ourselves back into the swing of things though, but those three WILL be missed. Our new uniforms are cute...cold as hell, but cute. lol *mumbling* lucky ty gets two sleeves ;P neways, gotta get going for now..lots to do..yep...and if I keep telling myself that maybe it'll come true :D hehe well bye for now, don't miss me too much! This pic makes me look like a chipmunk, and it's kinda old, seeing as it's from the beginning of last season, there have been better pictures, but oh well I still haven't figured out how to work my scanner, if I did I would put the pic of the whole band on here, and also a few of my Scranton pics, but oh well, you'll just have to wait. 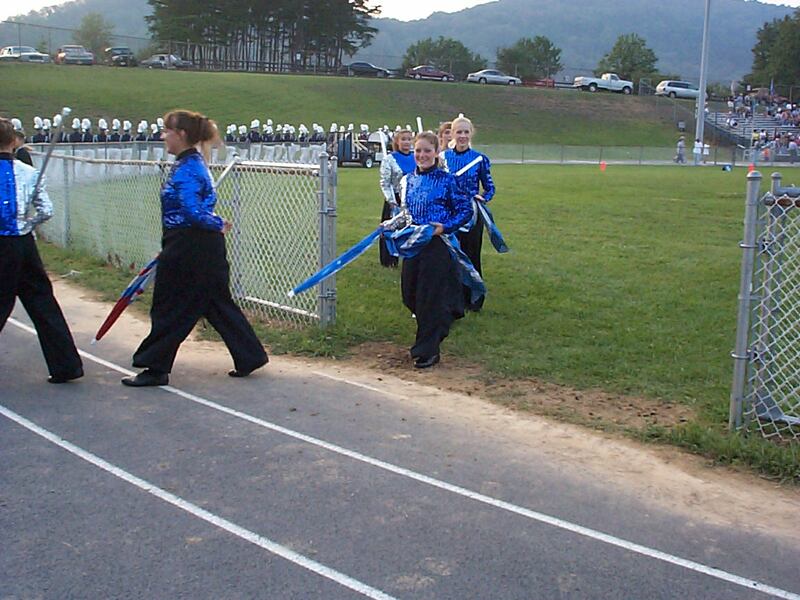 That pic above, is showing the band, then from left to right Brittney(half out of pic), Keira, Me, Sarah, Tasha, and Ashley Rizer. There was someone else behind Tash, but they hid from veiw.